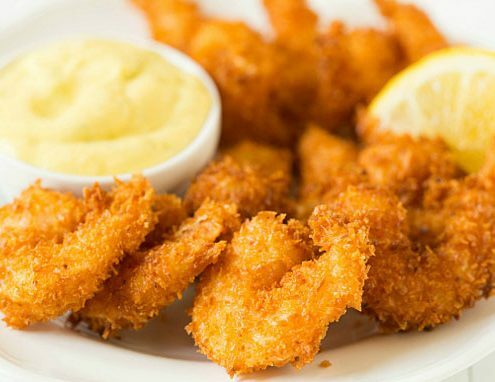 Breaded Shrimp – Axelum Resources Corp. Mix all together all the ingredients except the sweetened coconut and shrimp. Set aside. Fill off the skin of the shrimp, slice the back of shrimp ,wash and drain excess water. Dip shrimp into batter mixed, shake off excess, then press shrimp into sweetened coconut, turn shrimp over and press into sweetened coconut again. Pour enough oil into heavy large pot to reach depth of 2 inches, heat to 350deg F. Add shrimp to hot oil, deep-fry until cooked through golden brown color. Using Tongs transfer shrimp to paper towels to drain excess oil. Arrange shrimp on platter. If desired, serve with Kikkoman sauce for dipping.